This is what it looks like when you are HUNGRY to catch that disc! Big thanks to Peter Guyton for taking these during out games down at the Amherst Middle School tournament. Get excited Falmouth Rogue! It’s time once again to head to Amherst! Directions and more information can be found here. The official Falmouth Rogue caravan be leaving the parking lot behind the Falmouth High School on Sunday at 7:45am. If you are driving down and can offer a spot in your car to a player-in-need, please respond back to the email on the Falmouth Rogue Parents’ Group. Alternatively, if your player needs a ride down and back, similarly respond. We should be back in Falmouth on Sunday night around 7:30pm. Amherst 2015 was a success! From left to right: Teddy, Ash, Coach Shea, Jameson, Jake, Ayla, Julia with baby Anders on her lap, and Caitlyn, Anders’ big sister. Missing from the photo are Liam and Michael. An intrepid band of nine FMS Ultimate players journeyed deep into the heart of Massachusetts yesterday to battle against some of the best middle school ultimate teams in New England. The sun was beating down upon their heads like so many fiery raindrops but the players pushed through it like it was a cool spring day. In our first game we were pitted against the Four Rivers Boys team, a program with a rich 20+ year history that has reliably turned out top notch squads ever since. It was a great view of the future of our own program, though a view that was seen on the losing end of a 13-1 score. Still though, we did score one point and kept up high spirits throughout. Our second game came against the evenly matched co-ed Ottoson team. We jumped out to an early lead that held all the way through to a 9-7 victory (our game was capped, due to time, at nine points). And our final game of the day was against another co-ed team, PVPA, a small team that had just one sub. We won our last game 13-4. Two wins, one loss on the day. 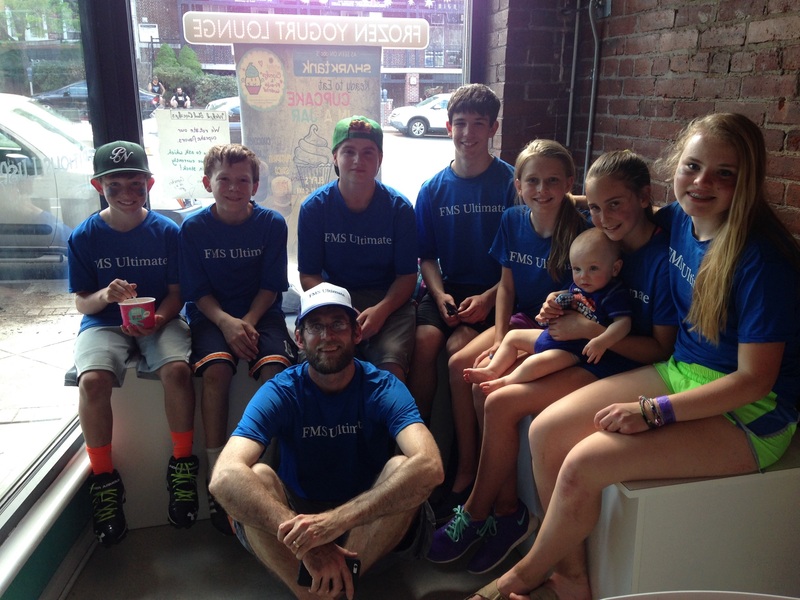 FMS Ultimate played like champs this weekend. They scored with long hucks and with short smart passes. They got wily D blocks. They ran their offensive formation and started to feel how smoothly the disc can flow around the field when everything comes together. It was great to watch. And we can’t wait to get back next year! Thank you to our host family the Zobels for their generosity and hospitality. Thank you to the parents who made the three hour trek down to Amherst to cheer us on. Thanks to the players for giving everything in the 88 degree heat. Thanks to Cumberland Ultimate coach Gregg Novick for giving us lots of helpful tournament beta. And thanks to Jim Pistrang, the Amherst tournament director and middle school coaching ultimate legend.